Austrian physician; born at Prague Sept. 9, 1837; best known as the body-physician of the emperor Maximilian of Mexico. Basch was educated at the universities of Prague and Vienna. In 1857 he studied chemistry at the laboratory of Brücke, in Vienna, and five years later began the practise of medicine. From that time until` 1865 he was assistant to Dittel, Jäger, Türk, Kolisko, and Haller in their lectures at the University of Vienna. In the last-named year Basch was appointed chief surgeon of the military hospital at Pueblo, Mexico, and soon after he was called to Maximilian's side; remaining with the unfortunate monarch for ten months, until his death, June 19, 1867. When, at Queretaro, Maximilian realized that a few days at the most would decide his fate, he commissioned Basch, Lieutenant Pitner, and Major Becker to keep daily records of all that happened. At the time when the emperor and his entourage were betrayed to Juarez by Lopez, May 14, 1867, Basch lost most of his memoranda, saving only cursory notes. When the alarm was sounded, Basch rushed to saddle his horse, but was at once overpowered by the Mexicans. After the execution of Maximilian he took charge of the body and returned to Austria with it (Nov. 26, 1867) on the "Elizabeth." 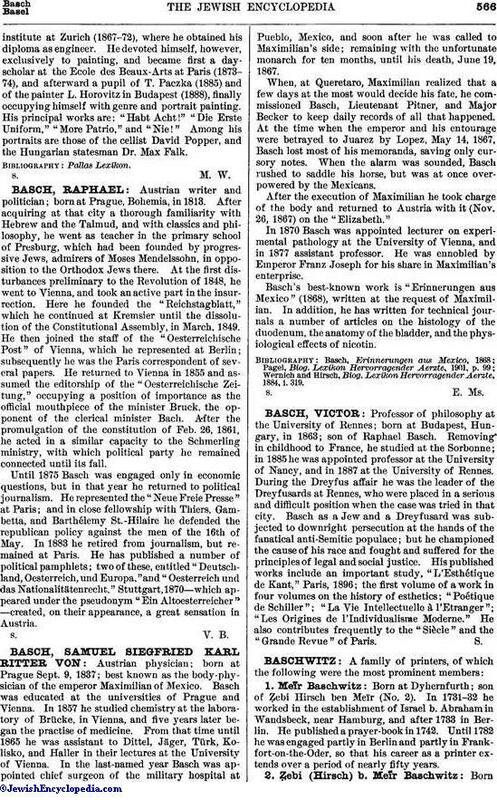 In 1870 Basch was appointed lecturer on experimental pathology at the University of Vienna, and in 1877 assistant professor. He was ennobled by Emperor Franz Joseph for his share in Maximilian's enterprise. Basch's best-known work is "Erinnerungen aus Mexico" (1868), written at the request of Maximilian. In addition, he has written for technical journals a number of articles on the histology of the duodenum, the anatomy of the bladder, and the physiological effects of nicotin. Wernich and Hirsch, Biog. Lexikon Hervorragender Aerzte, 1884, i. 319.